Margate, FL– The annual sponsorship of the Coconut Creek Eagles Football Program is just one of the ways that American Institute continues to provide opportunity while promoting community. As a Platinum sponsor of the local football program, American Institute School of Wellness and Beauty helps to fund the procurement of football equipment, uniforms and scholarships to subsidize access to youth sports for families unable to pay the program’s registration fee. The Coconut Creek Football Program was founded in 1997. The program initially only offered Flag Football and Cheerleading for the first five years of its existence. In 2002 the program added Tackle Football and Cheerleading as Coconut Creek was granted entry into the American Youth Football League (AYFL) as it’s 12th and final member. 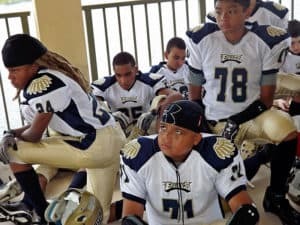 With the addition of the tackle program, the Coconut Creek Football Program now serves over 500 children in their tackle, flag and cheerleading programs and has over 100 volunteers and sponsors. For further information on the Coconut Creek Eagles Football Program please visit their website: www.creekfootball.com Not only is the sponsorship a rewarding feeling to everyone at American Institute but it also allows for the students from American Institute School of Wellness and Beauty the opportunity to provide chair massages and dry manicures at home games while cheering on the Creek Eagles to victory. “The sponsorship of youth sports is not only extremely beneficial to our local community, but allows our students the opportunity to use their acquired wellness and beauty skills in non-traditional venues. The parents, coaches and referees love the chair massages and our students love the opportunity to spend a Saturday afternoon in the electric atmosphere of a Creek eagle home game.” commented Campus President Richard McCulloch.